It wouldn’t be Christmas if there wasn’t a cake in the works! 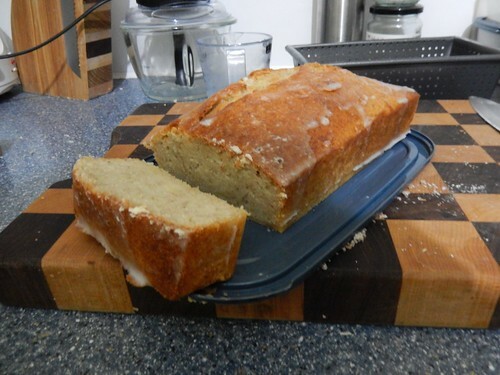 While I’m not actually a huge fan of the traditional Christmas Cake (although, that’s not to imply that I would turn down the offer of a free slice), I decided to have a go at banana bread, using this recipe from BBC Good Food. It seems to require a surprisingly minimal variety of ingredients. Obviously, bananas figure highly but I’ve previously made chocolate cakes that I feel have included a lesser share of cocoa-based ingredients. 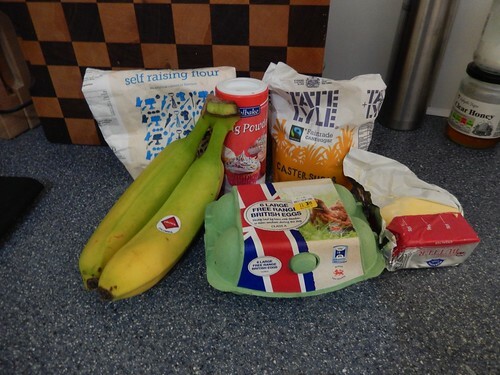 I attempted this recipe on the same morning after an early trip to a different Lidl store to my usual store – as it happened, the layout is exactly identical. But the extra till space along with the offer of parsnips means I’ll certainly be going back there again. 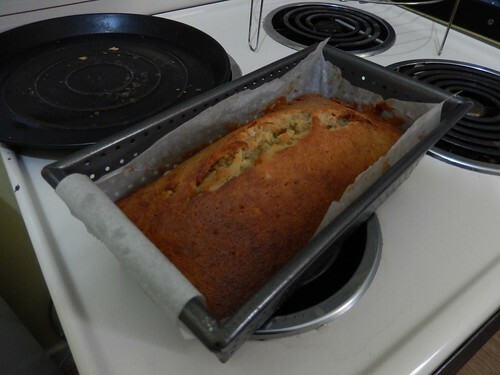 Anyway, I wanted some ripe bananas for this recipe. Almost everything else was already sat waiting in my cupboards. 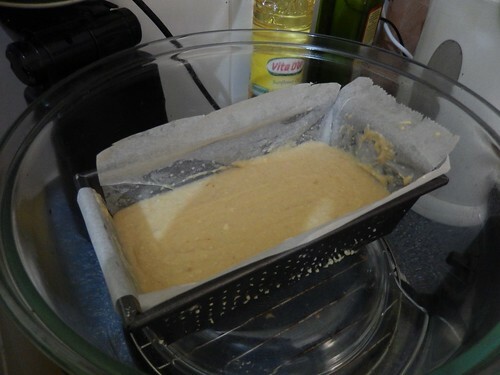 A perforated loaf tin – could this be the perfect cure to ‘unfinished’ baking in the halogen oven? 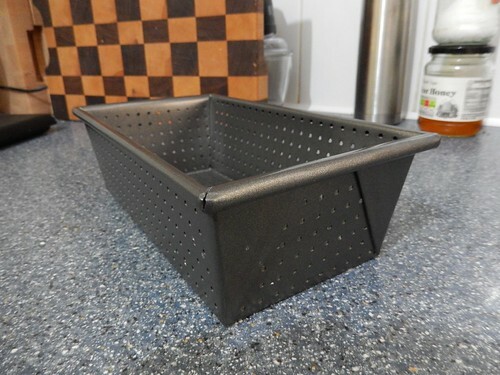 A week earlier, I purchased a perforated loaf tin in a local hardware store while doing some last-minute Christmas shopping (and no, not for myself – I’m not Tim ‘The Tool-Man’ Taylor). 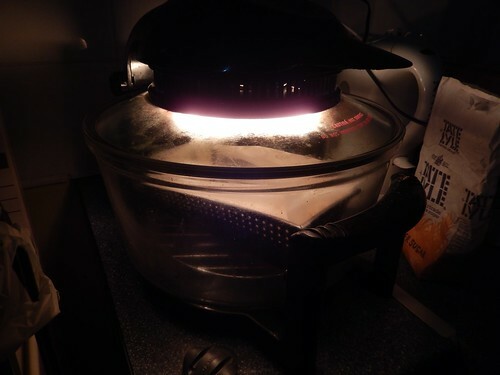 I needed a loaf pan for this but I wasn’t ware you could buy them like this and I thought it might help the soggy bottom problems that seems to plague almost every attempt to bake in my halogen oven. It’s easy enough to get this one started by mixing the sugar, flour and egg in one bowl. 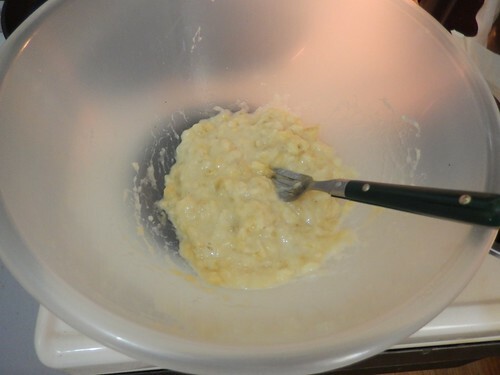 Elsewhere, you can mash the bananas (I chopped them before using a fork) before adding that to the mix. Attempting this recipe for a second time; I would mash the bananas as one of my initial steps. On this occasion, I didn’t do it until after mixing the flour but I think you’re supposed to be wary of the fact that self-raising flour will need to go in to the oven ASAP. I had expected it would fill the tin a bit more but I’d definitely purchased the correct size. 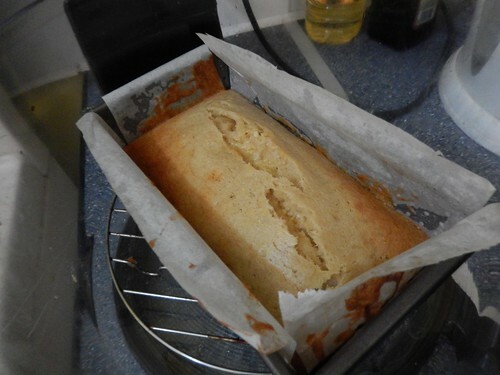 I even went to the effort of lining it correctly as well, by cutting two strips of baking paper (one narrow, one wide). I baked it initially for the full 30 minutes and at 190° (the default setting for cakes with my oven), which is 10° higher than stated. It came out looked very loaf-like on top yet, a quick poke with a skewer revealed it was very soggy down through the middle. I was so confident the new loaf tin would fix everything that I went ahead and used only the lower rack of the two I have available. The downside to this, I think, is that it doesn’t easily allow for air to circulate underneath. 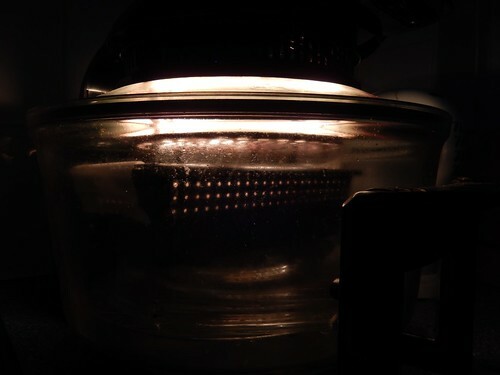 So, I think I then put it in for another 10 minutes, with a casserole lid inserted as a spacer (or riser) between the low rack and the tin. Another 10 minutes after that (an extra 20 minutes in total) and this is what I had created. It hadn’t risen as much around the edges but it was lovely and brown on top, which I think it what you want with banana bread. 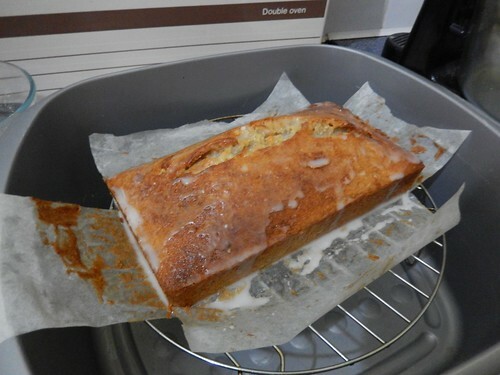 After cooling in the tin, I cautiously removed the cake and set it over my washing up bowl (a lesson well learned after the lemon drizzle mess) before pouring over the icing. Of course, the majority of this was only consumed by a single person but the others who sampled it didn’t rush to put it down or anything. It went down very well with a cup of tea and I intend to bake a slight variation on this later this evening! I think the icing was unnecessary. The added sweetness seemed a little over-powering. 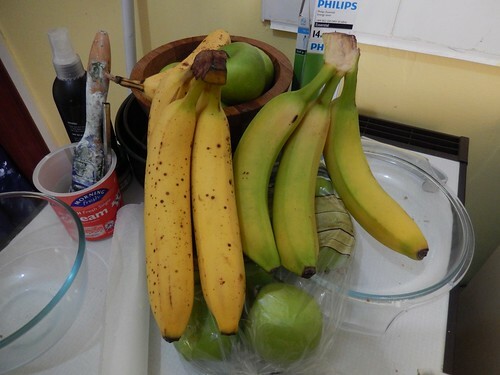 Next time, I will add at least one more banana. 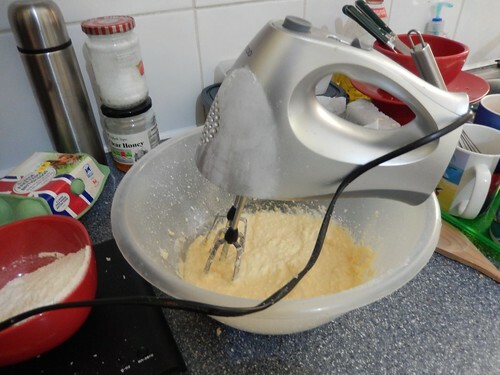 Mine isn’t as soft or moist as my friend’s was back in October (but I am still ‘practising’ with the halogen oven). I may need to purchased an un-perforated loaf tin just so that I can compare the results. Thanks for reading and Happy New Year to you all!